What Spices are Used in Greek Cooking? The best Greek cooking always utilizes a unique blend of spices with the perfect level of care, to make Mediterranean dishes unforgettable. The heavenly taste with every bite is just one of many reasons why we love these meals so much. Can’t get past the limitations of just a basic dash of salt and pepper? Well, here’s to experimentation! Play with spices to discover the hidden treasures in the true flavors of Greece. Of course, there are variations (such as by region, family, and cook), but there are certain, almost staple Greek spices that are likely to show up in most recipes. Some of those standards include mint, dill, saffron, basil, thyme, and fennel seed. And then, there are added traditional flavors designed to enhance those spices. While garlic and onions are edible bulbs and not actual spices, there’s no doubt they are essential to the blending of the immense flavors found in traditional Greek food. Along with wine, olive oil, and fresh lemon juice, garlic and onion bring home the best of the wonderful and distinct flavors of Greece. Mint is one of the most common spices found in Greek recipes. Fresh, versatile and fragrant, mint is as awesome with desert, as it is served with lamb. Here’s one way to use mint in a classic Greek way. Mix chopped mint with Greek yogurt, add kosher salt, a drizzle of extra virgin olive oil, chopped garlic, and a dash of red pepper. This fresh Greek yogurt sauce is wonderful served with meat, as a dip, or in a classic pita sandwich. Give it a try! Dill is a fresh-tasting, rather light herb, and is often used in pickling, sauces or served along with fish. If you want to experiment with dill, you can’t go wrong with trying this delicious version of Greek Orzo. For a wonderful delight, toss some dill in with cooked orzo, then add a splash of extra virgin olive oil, lemon zest, and some roasted pine nuts. It’s simple and quick, yet unforgettable. Saffron is a must in every cooking enthusiasts kitchen! A subtle floral flavor and amazing scent of this exotic spice will add a bright yellow color to your dishes and make even the simplest recipes taste delicious. Give saffron a try by bringing plain long-grain rice to a whole new level. Simply replace water with stock, and cook rice as directed. When the rice is half done, add a few threads of saffron, and let it finish cooking. There you’ll have it, a beautifully colorful, and sensationally aromatic tasty treat. Enjoy! 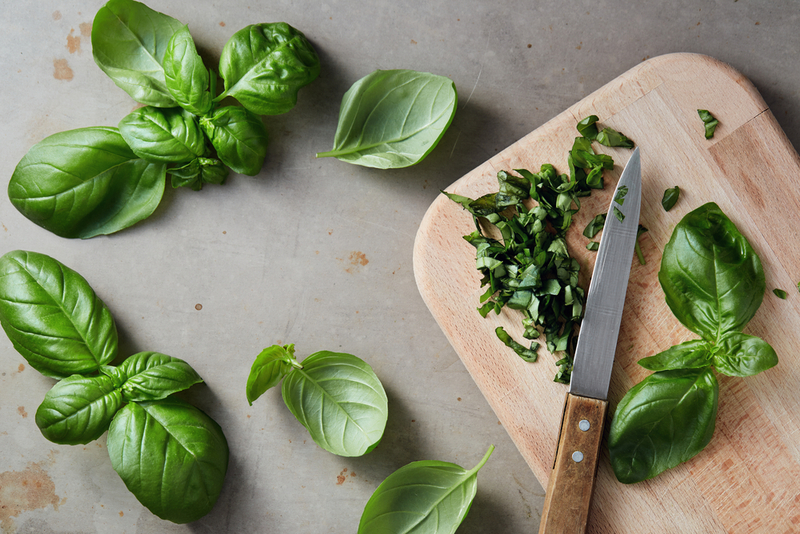 Basil has a slightly sweet and ever so subtle, peppery flavor. This one’s always great in sauces, but why not try it in a fresh salad? Just bring on the garden tomatoes, add cucumber, red onion, feta, freshly squeezed lemon juice, and of course, chopped basil. Simply delicious! This wonderful spice will add a light woodsy flavor to your meals. It is great in multiple meat and vegetable dishes so feel free to experiment. For variety, give this dish a try. Take thick-cut potatoes, toss them with a generous amount of extra virgin olive oil, a splash of lemon juice, kosher salt and thyme. Once you’ve tried these tasty Greek style roasted potatoes, you’ll never want to eat potatoes any other way. Fennel has a unique slightly sweet, almost licorice flavor that will spice things up a bit in your kitchen. So, next time you roast chicken and vegetables, experiment with a little fennel. Simply take a classic roasted chicken and vegetable dish, add a splash of your favorite white wine, a generous drizzle of extra virgin olive oil, garlic, and for that unexpected surprise, fennel seeds. Everyone will ask for your secret. When you’re hungry for authentic Greek food, made with only the freshest ingredients, the perfect blend of spices, and always with love, check out www.LemonAndVine.com. We’ve got everything you crave, and more!